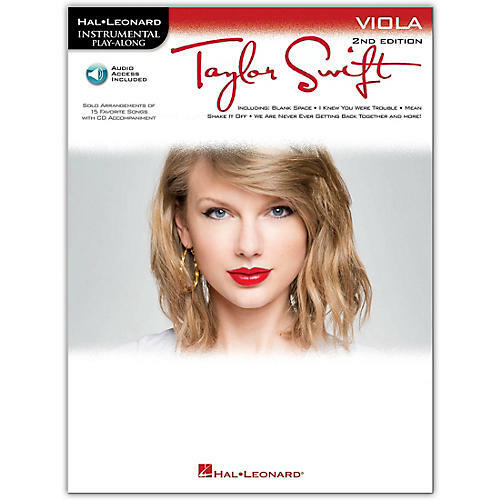 Part of Hal Leonard's Insturmental Play-Along Series, the Taylor Swift for Viola songbook/Online Audio combo features solo arrangements of 15 of the pop country chanteuse's most popular tunes to give young viola players something other than classic music to play to their friends and family. The second edition of these play-along packs feature new songs and access to demonstration and backing tracks audio online! Songs: Back to December · Blank Space · Fifteen · I Knew You Were Trouble · Love Story · Mean · Our Song · Picture to Burn · Shake It Off · Should've Said No · Teardrops on My Guitar · 22 · We Are Never Ever Getting Back Together · White Horse · You Belong with Me.